Another day of waiting on Eli. He was a little less demanding today, which was nice ;) He did well through the night, but woke up at 4:00 this morning in a lot of pain. Then when I tried to give him his pain meds, he couldn't swallow. It wasn't just that it hurt, but he physically couldn't get it down (it's liquid, not a pill). We waited about an hour, and tried again, and then he was able to take it. He still hasn't been able to eat much as far as solid food goes. Today, he had a couple of Ensure shakes, but that's it. I've been pretty much losing my mind with boredom. I can only watch so much Curious George and Cutthroat Kitchen with him! Today, I did some organization projects around the house, which actually felt good to get done. Noah was at my parents' house all day, so it was just me and Eli today. I hope that he heals fast! This is Andrew Peterson. He has intellectual disability, which of course made me think of Mark. He said that when he was a child, the other kids at school couldn't understand his speech, and a lot of kids would make fun of him (Mark was very difficult to understand as well). Andrew couldn't understand the rules of the recess games at school, so he started walking laps on the playground, and eventually running. Turned out he was pretty fast! 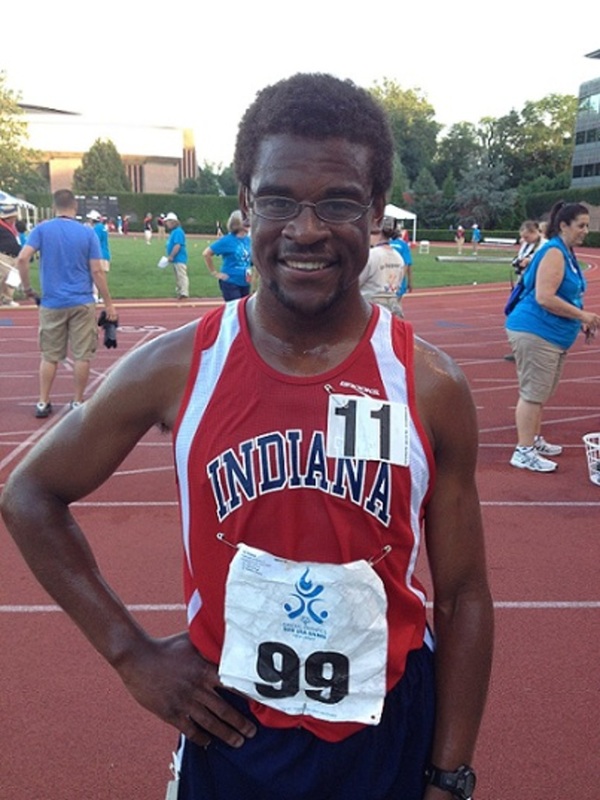 I won't write his whole story here, because you can read more on his Runner's World entry page, but he competes in the Special Olympics now. He gave a speech a couple of years ago, and I watched it on YouTube this afternoon. It's a little long, but well worth listening to. I kept thinking of Mark the entire time I listened to it, and it made me sad. Andrew thanked his speech therapist for helping him to be understood, and it made me wonder what would have happened if Mark had had the opportunity to work with a speech therapist at a young age (or even as an adult). I especially loved when Andrew said, "Special Olympics means more than winning. It gives we, the athletes, good chance to improve our fitness; compete with others who have equal abilities; feel good about ourselves; being an extended family; and show everyone that each person with an intellectual disability is not a nobody, but a somebody who can contribute to society." Anyway, there are lots of inspiring people who deserve to be on the cover of RW--I'm so glad I'm not one of the judges! But I hope that the editors will dig deeper into some of their stories, and maybe feature them in an issue one day. When Jerry got home, I was debating whether to go for a run or go grocery shopping. We were in desperate need of groceries, but I felt like I should run a few miles at least... so I ended up running to the grocery store (literally). Kroger is a little over three miles away, so I told Jerry to meet me there at 8:00 with my purse and my water bottle, and I headed out. It was hotter than yesterday, but still a pretty nice run. I kept my heart rate in the MAF zone (138-148). I did 3.23 miles at an 11:08 pace with an average heart rate of 145. Very similar to yesterday's run. That's so awesome that you literally RAN to the grocery store! You know Katie, you make the rest of us look really bad. Haha. Seriously though, you are such an amazing person. I really want to start running but at 225 lbs, I so scared of starting out wrong and ending up with an injury (It's happened many times before). I've been going through your blog, searching out all of your "how to start" posts and tips. I'm still scared and am currently saving up for a decent pair of running shoes. One day I hope to do things like you (gotta run and get groceries?, why not fuse them and do both!). I'll get there one day. So awesome that you ran to the store. No excuses! You inspire me! I voted for Andrew for the cover. I hope he gets it! Aw! My brother is cognitively impaired. I love him so much and his life is SO hard… I hope he finds something he's as passionate about as Andrew Peterson. It reminds me that anyone can offer something great to this world and that I need to keep reminding him he can too.